Another entry in which I find myself in the early-90s stage of Meryl's career in which she plays her less-honored but no-less-talent-filled comic self. Possibly one of the most well-regarded choices she made during this phase was as the drug-addicted diva actress Suzanne Vale, who, when forced to move back in with her aging actress superstar mother (played brilliantly with Debbie Reynolds-esque chutzpah by Shirley MacLaine), finds herself struggling to make her long-awaited big-screen comeback. 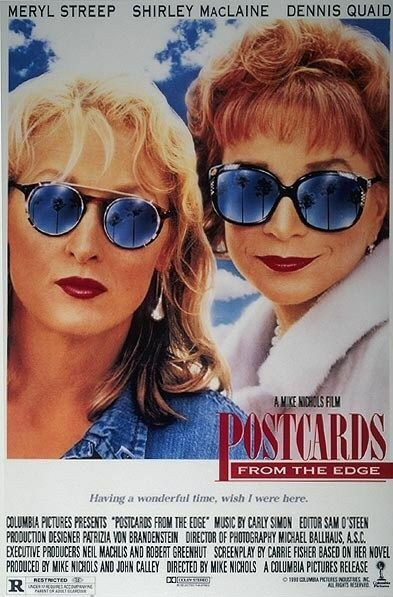 Based on the semi-autobiographical book by the hilarious Carrie Fisher, Postcards from the Edge follows Suzanne through her unsuccessful attempts at regaining her screen presence, along with the occasional bouts in rehab. (Wow, this movie perhaps hasn't entirely lost its touch with true Hollywood norms, eh?) 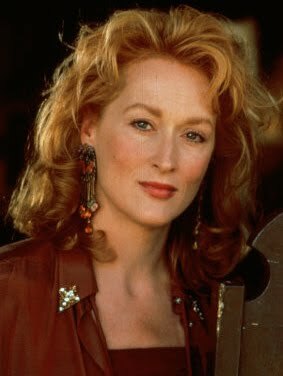 And though Meryl's character could easily have faltered into the entirely unlikable - she's somewhat of a spoiled brat rich girl with reckless abandon when it comes to her health and well-being - her troubled actress is strangely down to earth. She has just enough girl-next-door regularity to pass as someone relatable. The true greatness at play here, though, is Streep's interactions with her on-screen mom, MacLaine. Shirley's Doris Mann is a larger than life personality (most reminiscent, perhaps, of Debbie Reynolds' stint on Will and Grace in the late-90s) who has a major following in the diva-loving, showbiz-addicted community. She's a former big-screen beauty queen with a big voice and a sassy attitude to match. And Suzanne is completely the opposite - Meryl's character is a subdued sort with a snarky attitude and a hesitancy when it comes to utilizing her actually rather good singing voice. But thank goodness she does - without it we wouldn't have gotten the best scene in the movie (and probably one of Meryl's superior singing scenes from her films, if not the best), "I'm Checkin' Out," a gutsy country number that Suzanne belts out like only a washed-up former drug addict could. So likely thanks in most part to Fisher's original and unique source material (have we ever really seen this side to show business and mother/daughter relationships before this film? ), the films rests gently on the shoulders of these two talented ladies. Though Streep's comic side is far less evident here than in movies such as Death Becomes Her or The Devil Wears Prada, she nevertheless elicits a few chuckles through her deadpan delivery of banter with her boozy, overbearing stage mom. This is a side we rarely see. It's Meryl as a youthful, rebellious teenager sort - Suzanne never grew out of her dependency stage or her backtalking adolescence - and it's a refreshing, if atypical, side to see. I've never seen this, though I loved the novel. It sounds like a goodie, and Shirley MacLaine is always excellent. At RG, the users create categories, ranking movies in their favorite categories and browse other members’ rankings to discover movies they did not know. Hope you will come check it out and join.